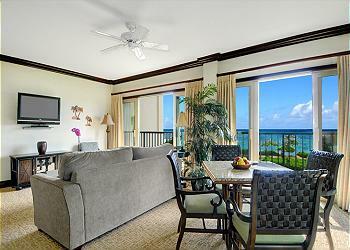 One of 6 corner executive suites, this third-story oceanfront location is spacious, luxurious and absolutely stunning! With northern views of 100 year old coconut groves and eastern views of the oceanic horizon, your surroundings are purely paradise. 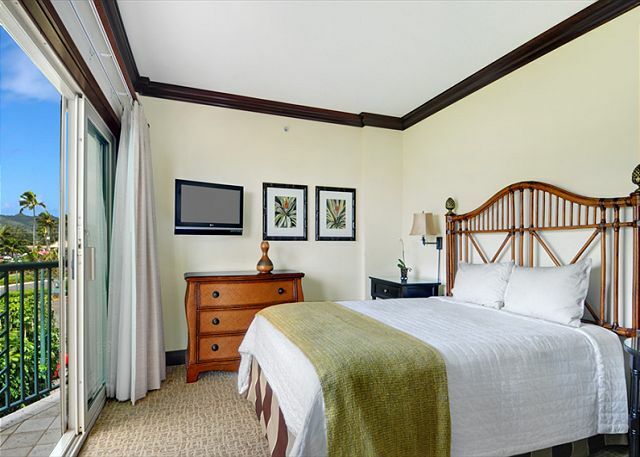 Featuring a king bed, a queen bed and a queen sleeper sofa, this suite can comfortably accommodate 6 people. 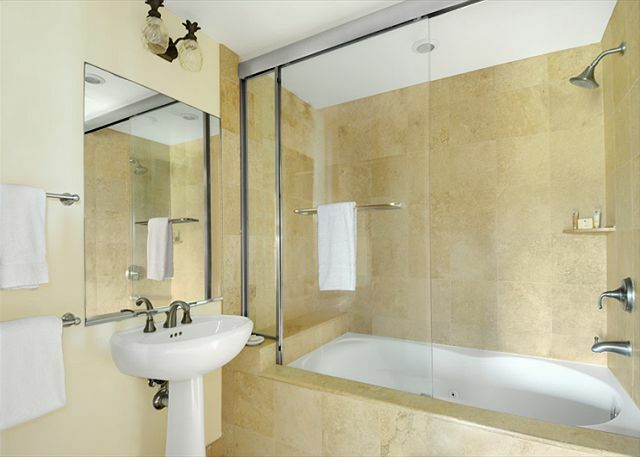 The stylish interior includes a stately kitchen with a Wolf glass cooktop & oven, Sub-Zero refrigerator, GE profile microwave, Fisher Paykel dual dishwasher drawers, granite counter tops, African Mahogany cabinets, three full bathrooms with Peruvian Travertine stone surrounds and soaking tubs. Enjoy the clean design and convenient location, with the beach and boundless Kauai adventures just beyond your private lanai. Beautiful condo, fantastic views and location. Had everything we could possibly need for our stay. Ample room for 2 couples staying together. This was our first time to Kauai and we absolutely loved the island. A friend referred us to Waipouli and we will definitely be back and hopefully this unit. It had everything we needed and it was nice that the pool provided daily towel service. The pool was gorgeous and my kids loved the waterslides. Great location with Safeway and Starbucks right across the street. Close proximity to an amazing bike trail. 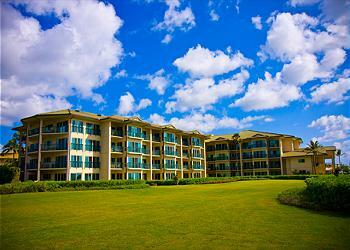 What a great location on the corner of Building G at Waipouli Beach Resort. Beautiful views, huge balcony, Would definitely return. We had a wonderful time at this lovely condo. Great location, beautiful pool and grounds, beautiful views from 2 sides. Couldn’t have asked for more. Our family of 5 loved it. The condi was very spacious and clean. Thw views were spectacular. The location was centralized and all area easy to access. We all absolutely loved it! Beautiful unit with a beautiful view. Better even than the pictures. Not in the control of the property managers (obviously)-- it was just a bummer that the weather was overcast, cool, and windy almost the whole week we were there. We will just have to come back another time-- we'd definitely stay at this property/unit again. We booked G301 for a post-Christmas/New Years Holiday. Wow. What a fantastic unit! Yes, there seemed to be a slate of maintenance problems, but every one of them was fixed immediately. The garbage disposal, dishwasher and dryer all needed repair/replacement and the maintenance team addressed the issue without us having to be there. 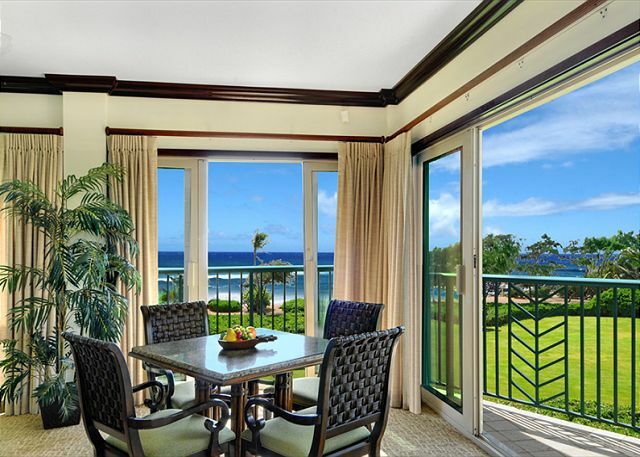 The condo is HUGE and the lanai and view are beautiful. The only negative is that we could never get the wifi to work. I cannot say enough good things about this unit! Wonderful beach, unpeded view and access. Large, comfortable condo, 2 masters w/ own baths, well equipped kitchen. Beds are on the soft side, so not good for people needing firm. 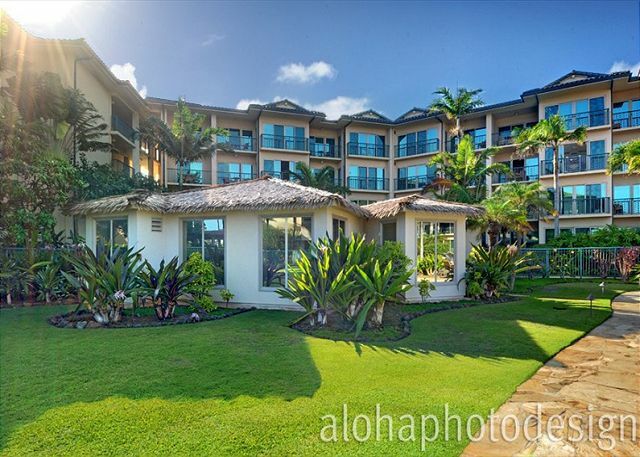 Main lanai overlooking parking, but huge windows that open in living/dining area to sit in front of and enjoy the scene. 3rd floor location w/ elevator, is high enough for a better view. 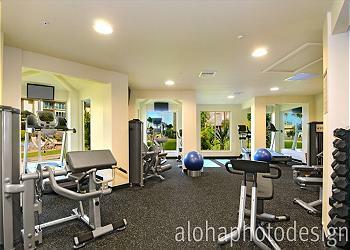 Beautiful pool and well equiped exercise room w/ televisions. Instructions for where the DVD player is and how to use (master bedroom), a few glitches with WIFI. Villa was clean, well stocked, and in a quiet private location. Amazing views! I would note that the ocean views from the living and dining rooms are breathtaking but there is no outside balcony across the front of these areas for a full ocean view. There is a partial ocean view and mountain view from the balconies off the kitchen and bedrooms. The pool area is nice and the oasis restaurant was delicious. Staff at pool and restaurant very friendly. Can't wait to return! G301 was a perfect unit for us. Corner unit with full ocean views. No pool or restaurant noise. The condo was clean, comfortable and fully stocked with kitchen items, linens, toilet paper, paper towels... we would definitely stay here again. Town of Kapaa is great for quick bites and stocking up on groceries. Just 30-40 minute drives to get to north side and south side of island. The beach front in front of complex also a great spot to relax..not crowded at all. The pool was a favorite spot for the kids. Very large, modern and clean unit. 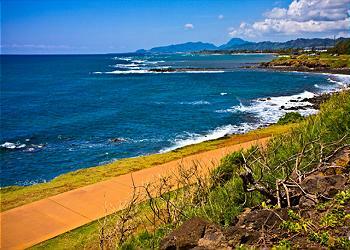 Great location for day trips to north and south shores of Kauai. We really enjoyed ur stay. Very nice condo. 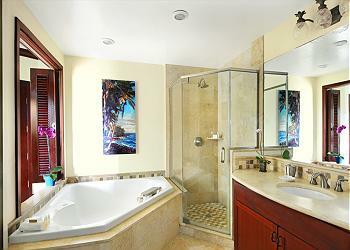 Very clean, lots of towels, and stunning views of the ocean. Great place to stay while on Kauai. Our only complaint is the door and pool access, remembering all those digit codes is ridiculous! We rented out 2 units. The ones we had each had 2 separate bedrooms and 3 full bathrooms. These condo units were excellent. The view and location were perfect for us. We could quickly go to Foodland or Safeway for food and beverages. The Lanai's were large enough to accommodate all of us for meals and just relaxing. We thoroughly enjoyed these units. The views were so relaxing and enjoyable. The Coconut Coast trail was also very close for running and walking. It was a perfect way to celebrate our 40th Anniversary with our family. It was exactly as expected. We had a few issues with some facilities in the room, but the property management company was Awesome, and they worked out all of the issues immediately. We were married in Kauai in December 2016. Friends and family (12) stayed at the resort in 3 units at Waipouli. Although each unit was in a different building - everyone was extremely happy with accommodations and amazing view and service. The pools and hot tubs were wonderful and clean and not overcrowded. 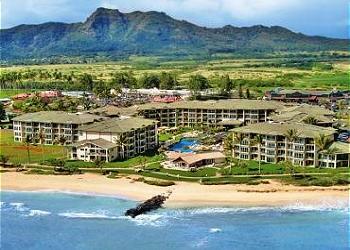 Location of the resort on Kauai is convenient to reach other parts of the island. Stores and shopping and great restaurants within walking. 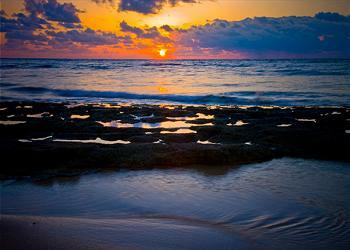 Views of the beach, sunrises and sounds of the surf amazing. All 12 of us agreed we wouldn't stay anywhere else. Can't wait to return to this beautiful Island!! The unit had to be one of the best in the complex. Large balconies with great views of the ocean and The Sleeping Giant. Very specious and equipped kitchen. The only negative I saw was the combination to get into the pool area and fitness room seemed to be a pain for several people. I will be back again as soon as I can. We stayed in unit G301. Very quiet unit with a great balcony and wonderful views from the balcony and interior of the unit as well. Great build quality as well. In addition the management company offered wonderful service as well with helping with restaurant suggestions, booking excursions for me, and allowing an earlier checkin. Would 100% stay here again and recommend to all. Monk seals just out the window. This unit was wonderful. We spent 5 nights and loved it. Loved being right across the street from Safeway and Starbucks. The beach is not great die swimming but great for just viewing the ocean. The grounds are very clean and well maintained. The pool area is big and the lazy river is fun. Our family loved it. Easy to find Lounge chairs every day. We also rented bikes from the spa downstairs and that was a fun easy ride to Kealia beach. The fitness center is great as well. This resort was the best. We found the location between princeville and Waimea canyon convenient. Safeway directly across street made getting basic essentials so easy. The small town of Kaapa was within walking distance we enjoyed it. The condo was perfect location beach and mountain view. The resort and grounds breathtaking. Would absolutely recommend to others and we would stay again. Very spacious and well equipped condo especially for higher end tastes. We were very impressed with condo and the complex. The condition of the unit was excellent and all the items in the unit were first rate. The resort was in a great location and well kept. We had a terrific time while there. 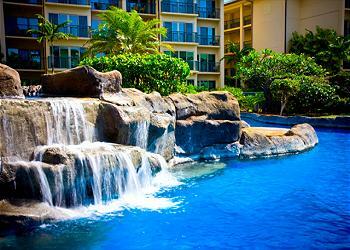 We highly recommend this facility to anyone planning on spending time in Kauai. 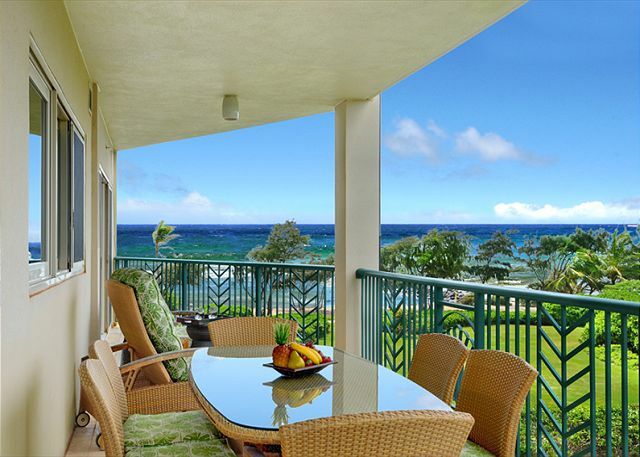 The condo is right on the ocean, you can hear the waves, feel the trade winds from your balcony. It was very quiet and peaceful, you would never know your in a huge condo complex being on the end unit with no neighbors, just views of the Pacific Ocean amd amazing sunrises. Love very thing about this unit. It is my third time back and look forward to next year. 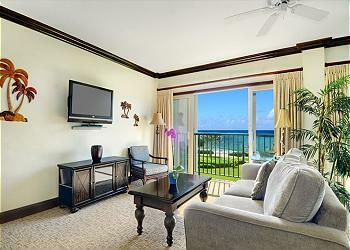 Unit is quiet, private with full ocean view. Could not have asked for a better place to stay. The room was as advertised. The only negative we had was the 10am early check out. Fabulous unit with spectacular views! We stay in condos across the U.S. and were very pleased with this unit's size, layout of indoor and outdoor space and grandeur of furnishings. The kitchen knives were horribly dull (a common problem), and some of the nonstick cookware should be retired, but these are small issues in the scheme of things. We needed an extra parking pass for a 2nd car, and called the security office twice and left messages with no reply. I spoke to a security staff member who was perplexed, and wondered if the email had the correct number. The staff at Kauai Exclusive is friendly and attentive, and Sonja Keale our concierge is fantastic!!! 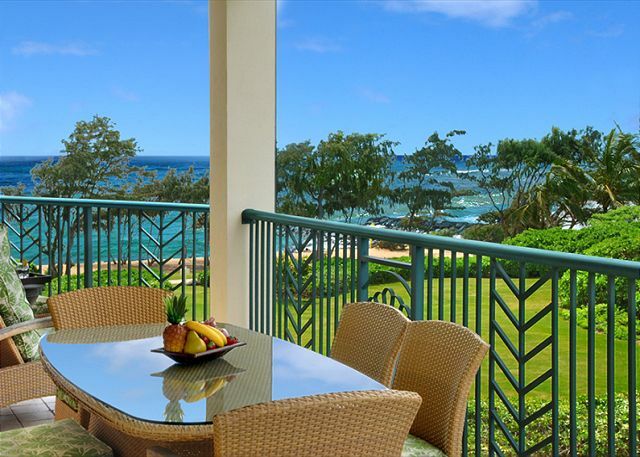 Fantastic condo, ocean front location, very roomy, views of ocean and mountains from the lanai. Really loved staying here with our young kids. Proximity to everything worked well for us. The layout was lovely and had high end appliances. Property was clean. Liked the balcony and the ability to sit out and enjoy the ocean and sunrises. Only complaints: kitchen taps were loose, no dish cloths and no pens to be found. Otherwise, very well equipped. Mahalo for everything and for sharing your home with us! 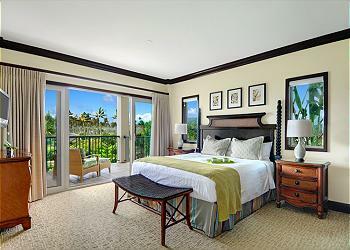 This corner unit faces east and south and has by far the largest lanai in the resort. The unit is spacious and very well equipped and organized, everything in its place with helpful notes on the operation of equipment, except it was not clear where to dispose of garbage and recycling. The water park in the centre of the resort is amazing and great for families wanting to relax at the resort. Safeway and Foodland just across the street was very convenient. Kauai Exclusive Management was helpful, thorough and reliable in all pre-arrival services. Excellent location. Unit is on the beach. Excellent views. Oasis Restaurant food was ok. Condo grounds are very well maintained. Pool area needs more lounge type chairs (people put towels and items on chairs to hold them all day and leave causing a shortage of lounge chairs). We noticed people took pool lounge chairs to beach. Had a small issue with the room but property management was very responsive and immediately took care of us. Condo was fairly clean, but windows needed to be washed. Couch, carpet and floors (socks got dirty from tile floor) need to be cleaned. Could not rate unit as "spotless". Unit will need a refresh in future. Fast wireless connection. The unit was excellent. The furnishings and connected hotel were very well maintained and had nice amenities. The rooms in the condo were very spacious and the quality of the finishes were first class. The condo is about half way between the north and south parts of the island so getting around is easy. Traffic right around the hotel is a little congested, but nothing major. We had a problem with the dryer not working part way through our stay and the management company made arrangements in another empty unit for us to use that dryer. They were very accommodating. I would highly recommend unit G301. Thanks for putting us in such a beautiful unit. It was perfect. Our family had a great time! This is my second year. The unit is perfect, private, quiet, and spacious. The management team is excellent. They answer emails right away and offer to fix the tinest problem that comes up. The unit was as it appeared online, and had very good views since it's a corner unit. It was a short distance from the parking lot to the elevator to the unit. The major negative is that the beach was not enjoyable- there was a large reef just offshore so swimming was very dangerous. Additionally, there were many Portuguese Man-o-war jellyfish all over the beach. If you like going straight from your condo to the sand, this is not the resort for you. However there is a very good beach up the road, just a 4-5 minute drive. My husband, son, his new fiance and I spent the last 5 nights of our vacation in Unit G301. It was spacious and very well furnished. We had beautiful views of the ocean and mountains from the lanai and the ocean breezes were awesome. 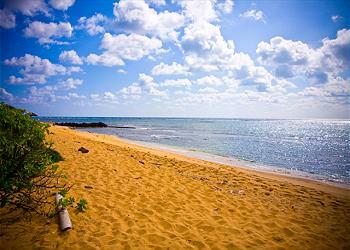 The central location of the property allowed us to explore the island easily and often. The entire property was well maintained and the pool area was great. We would definitely recommend this property to friends and family. nightmare turned into a dream come true! 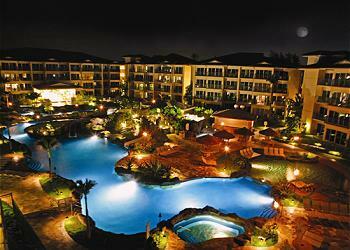 had booked the cliff house in Lihue. Upon arrival was found to not be as advertised and we were extremely disappointed. Called Kauai Exclusive and they upgraded us to this paradise. Amazing unit with everything you could want or need. Loved the location and the property. Amazing experience there. Just wished we could have stayed longer!! We really enjoyed our stay at waipouli! The location was great and the unit was perfect for our family! Sonia was great helping to book us for luau. She gave helpful advice. Thanks! Would definitely stay here again. Our family very much enjoyed our stay in Kauai and working with Kauai Exclusive Management. Another unit we had reserved dropped us and the management team gave us the option to rent G301 instead. At first we were disappointed until we arrived. The location was really private, great views of the ocean and in our opinion a much better location than where we were suppose to stay. Loved the layout and all the comfortable furniture. The kids absolutely loved the resort pools and so did we. I would highly recommend this particular unit. We loved our stay. We loved unit G301! The views were amazing with the ocean right there on one side and lush mountains out the other. The quality of the unit and furnishings was top notch other than a couple minor issues (one of the screens was torn and the master Jacuzzi tub didn’t work). The pool with water slides was a hit with the kids and adults! Location on the island was great in that we could hit south or north beaches and sites in 30 or so minutes depending on the weather. One drawback was the beach right outside the unit, while nice, is really not swimmable as its very rocky. We paid more than we typically do for vacation accommodations and have no regrets, we loved our stay. We came to Kauai during Christmas to celebrate our 25th Anniversary with our children. What a truly awesone way to end the year! This was our second trip to Waipouli (7/2007) and it was even better this time....mostly because of the unit. We think G301 or G401 could possibly be the best units in the entire complex. 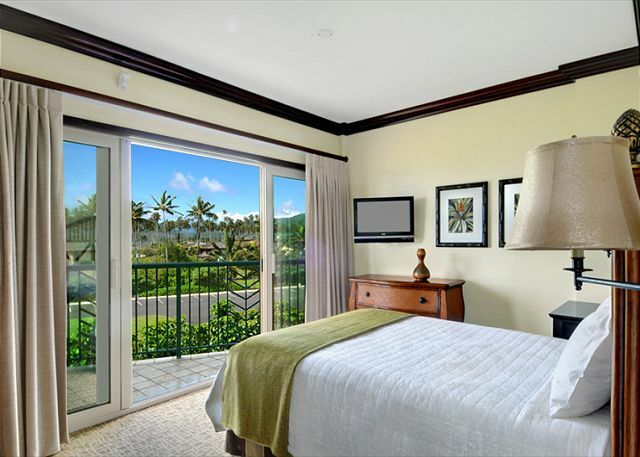 Our view was literally 270* with both ocean and mountain views from the rooms and expansive lanai. 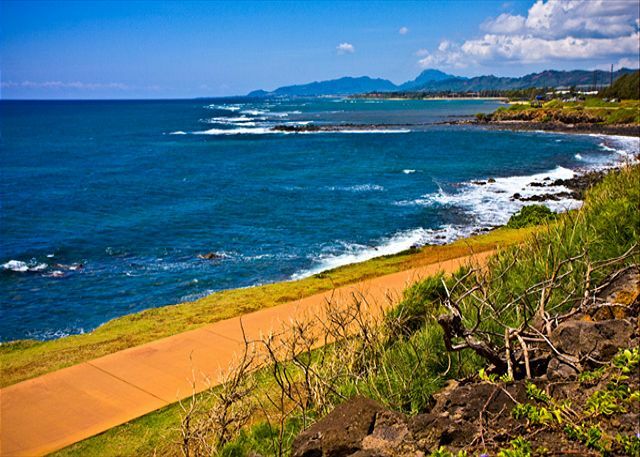 The midpoint location in Kapaa is perfect for all the island excursions that you need to do on Kauai. We highly recommend a Waimea Canyon excursion, Kalapaki beach next to Kauai Lagoons, and hiking the trail at Ke'e beach. Blue Dolphin tours provide unforgetable journeys. We did the Napali coastline snorkeling in July and whale watching sunset tour this time (seasonal). The unit itself is very comfortable and the 3rd bathroom made it much nicer for our family of 5. The kitchen was nice to be able to cook our own meals....eating out would be very time consuming AND expensive. There are 2 grocery stores across the street-we preferred Foodland. Enjoy your trip to the Garden Isle! 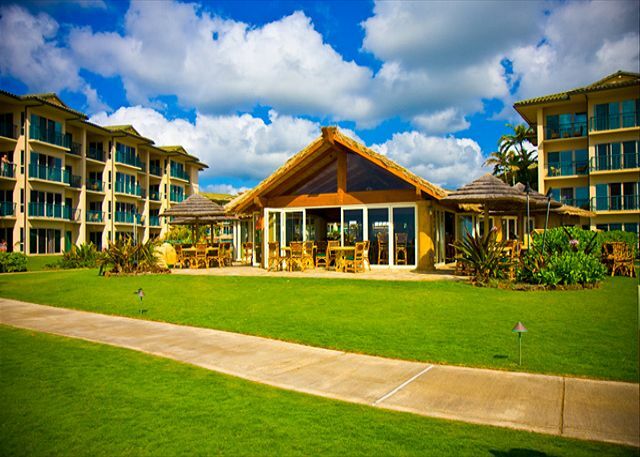 After spending 12 days at Waipouli Beach Resort I was relieved that I used Kauai Exclusive Management. Josh, Patrick, and Sherri are an a amazing professional vacation rental team. Every email, phone call, repair, question, and concerns were addressed immediately. The resort is about 15 minutes away from the airport. My gorgeous and immaculate condo, G301, had an unblocked private ocean view 150 feet from the beach! 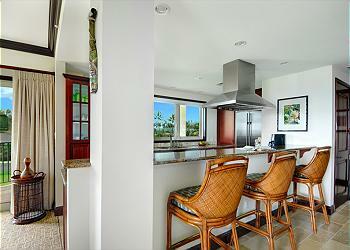 I had a gourmet kitchen with a huge private lanai. 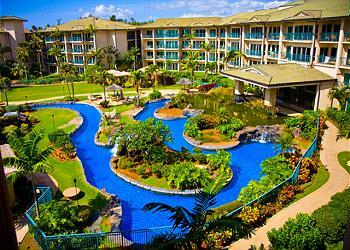 I loved the resort grounds, swimming pools, and Poi Pond. But there is more! Safeway, Starbucks, Longs, and a big health food store is across the street. Plus the location is the 1/2 point to Princeville and Poipu. Perfect great vacation. I loved it. Waipouli Beach Resort is FABULOUS! The location is perfect. Close to everything. The unit was very nice. The property was a bit aged and the restaurant was not very friendly. Overall, we had a wonderful time and love Kauai very much. We loved the unit! My biggest complaint was the master bath. The toilet lid was very loose, the jets on the tub did not work, and before we figured that out we tried opening the window doors and the left panel didn't work properly so we had to maneuver to get it closed well enough and then kept it closed for the rest of our stay. The window and toilet weren't too much of an issue but the jets on the tub were a huge disappointment. Can wait to come back next year. Only issue odd smell from master toilet even after cleaning it several times t/o stay. 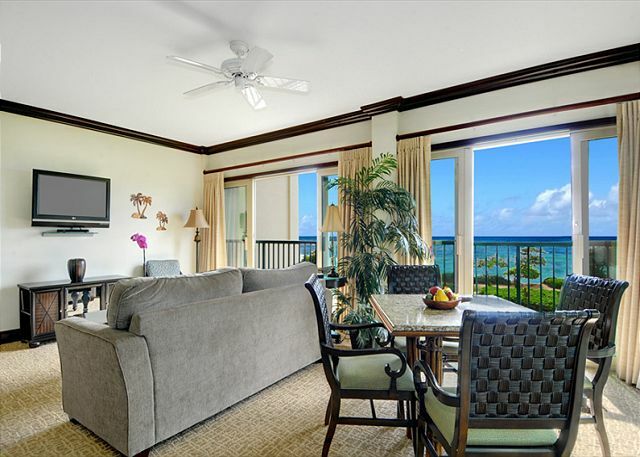 We were excited to find this unit exactly as pictured with beautiful fixtures and an expansive furnished lanai. Beautiful views from every window and balcony. We stayed at Waipouli along with another family (who were in a different unit). Kids enjoyed the pool and slides, and the grills were sparkling clean. Nice location near Kapaa and Safeway grocery store right across the street was very convenient. We had a wonderful time! Awesome property!! Highly recommend it. We stayed in G301 at the end of May/early June of 2013, the weather was quite humid, so we were delighted to have AC during the heat of the day (overhead fans nice at night). Easy shopping across the street, 20 minute walk into Kapaa, 5 minute walk to bike rentals to bike the Kauai Bike Path (a must if you stay here). Very deluxe rental, just know that the beds are thick tempurpedic style mattresses, very different from our firm bed at home. Resort wifi had a weak signal, as did our phones, if that matters. We went to the restaurant on site, Oasis on the Beach, for dinner and brunch, and it was out of this world 5 out of 6 times, a fantastic farm to table restaurant oceanfront. The pool really is for children and sunbathers (barbequers in the evening). The Fitness Center was great, nice to have AC, all the equipment you need, in a nice location. Everything was perfect! It was a great place to stay and I would definitely come back. My family of 4 really enjoyed our stay in this unit. The unit was clean and very well stocked with supplies. The view was awesome. We had dinner on the large lanai every night. Our kids enjoyed the pool a lot. Great location, great property, great amenities. Management company was easy to reach and helpful. Stayed 10 days and very satisfied. The unit is well appointed, clean and most important of all very private. We stayed in the same complex but facing the pool and right above the restaurant kitchen. It was very noisy and the smell from the restaurant unbearable. One improvement could be to get better mattresses for the beds. We were so pleased when we first walked into the unit...clean, immaculate, and inviting. The suite is well appointed with great amenities and a gourmet kitchen that we utilized a good portion of our trip. Of course going to Hawaii is not about sitting in your condo, but getting out and enjoying the surroundings. That starts first at the Oasis on the Beach - the resort bar and restaurant. Vanessa and Joel were amazing at the bar and the live music added to the evening. We can't wait to get back! we stayed here on our honeymoon. we stayed in G301 which was an awesome room - 2 bedrooms, 3 bathrooms, top-notch kitchen, balconies and great common area. The resort is great if you want something not too large (too many people), on the ocean, with pool/3 hot tubs, great restaurant, lots of places in walking distance (Papaya food market is like a whole foods and is 3 minutes across the street by foot). a key here was that we rented through the guys at Kauai Exclusive Management. They are the agents for this unit and others at this property. they gave us a great price (for 5 nights) and when we had a minor problem they were on site and fixed it within the hour. location is great in the middle of the island, everything you need is there (spa too) and with a sweet kitchen you can make your own meals (relaxing breakfast or grill dinner fish by the pool). Nothing but positives to say about this unit and the complex. G301 is on the far corner of the property and away from the pool and other buildings. Great open views to the ocean as well as privacy. 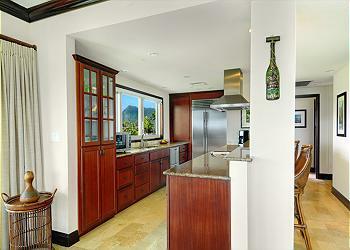 Unit has all top-of-the-line finishes and appliances; really just a fantastic place to spend the week in Kauai. The location is great as it's 20 minutes to the North or South side plus there are lots of diverse restaurants nearby. Grocery and Starbucks right across the street - walking distance. loved the property. Great stay.